Upon riding a fortuitously placed updraft into the evening sky and launching a final light arrow directly into Calamity Ganon’s massive, pinkly glowing eyeball - a privilege extended only to those players lucky and talented enough to make it through a perilously possessed Hyrule Castle, snipe an enraged lesser-version Ganon off the walls of a rocky underground cavern, and then successfully dodge his upgraded lumbering limbs - I set down my controller to watch Link and Zelda wrap things up and, perhaps more importantly, reflect on the hours I spent exploring Breath of the Wild’s sprawling landscape. Exactly how many hours? Well, according to my Nintendo Switch, which for unexplained reasons can only vaguely estimate stretches of time despite being, you know, a computer, somewhere north of 75, although just how far north is anyone’s guess. My attitude towards the game as I played through it navigated a hilly roller coaster of emotion, from the lofty peaks of the introductory area, where I participated in a universal human experience like birth or death or losing your virginity and felt pure awe seize me as I stepped out of the starting cave and gazed out over the plateau, acres upon acres of raw countryside unspooling in the distance; down into deep valleys of boredom punctuated by incredulous, almost guiltily ungrateful thoughts: “Is this all there is?” How dare I stare straight into the mouth of a gift-horse like BOTW? Was my perception that the game fell far short of its myriad perfect scores maybe just outright wrong? No, of course not. Everything’s objective, including - especially - any given player’s enjoyment of a particular video game. From my uniquely-me perspective, BOTW gets so much so very right - and maybe gets those things more right than any other game in gaming history - but so much else left me feeling detached from the inarguably beautiful world Nintendo was somehow capable of (nearly) seamlessly weaving together. Speaking of which, the area where BOTW most excels is the obvious one, and it’s not hard to capture in my butterfly net and pin down: Hyrule itself. BOTW’s epically sprawling, infinitely climbable edition of Hyrule presents the absolute embodiment of what years of alterna-Hyrules dating back to 1986 could only attempt to symbolically represent, and it’s magnificent. Through wildly distinctive zones that flow naturally and subtly into one another, each with its own climate and topography, and carefully tucked-away secrets blanketing every inch of the landscape, BOTW pays respectful homage to all previous Hyrules and upgrades them straight to Level 99. You can climb, pick up, cook, and fight everything, and you can harness the environment to effectuate your own dark purposes, whether those be to electrocute a puddle full of prancing bokoblins to death or to wreak havoc upon an unsuspecting lizalfo from above by nudging a boulder off a ledge and, with a little luck, directly onto his head. You can glide for absurd distances, light a campfire to keep warm in the snowy reaches of the northwest mountains, use a shield to surf down grassy hillsides, and loose arrows from horseback. BOTW’s Hyrule is, in a word - and in every sense of that word - awesome. So what could possibly derail a train with that sort of momentum? Well, nothing really, although I’ve found that the mileage you get out of the game is totally dependent on your expectations going in. If you approach BOTW looking for a Zelda-themed sandbox - a huge puzzly overworld replete with secreted-away nooks and crannies, a grotto wherein is enshrined a Master Sword, and assorted towns filled with familiar characters from Zeldas past - then you’ll likely walk away thoroughly satisfied. If, however, you show up expecting anything more than the most cursory narrative structure, or even a logical sequence of shrines that might impart a boomerang or a grappling hook to help you reach new, previously inaccessible areas, long a hallmark function of the series, you might wind up like me: a little turned around, borderline confounded. BOTW’s presentation and mechanics are top-notch, but where it began to lose me, and where it could learn a valuable lesson or two from its contemporaries, is in the way it handles the idea of permanence. As I’ll get to later, permanence (or lack thereof) in BOTW has implications that touch on far more than weapons alone, but weapons are a great place to start because of how early on they crop up as an example. One of the first things you’re likely to pick up at the beginning of the game is a tree branch, and one of the first things you’re going to do with that tree branch is thwack something with it, and sooner or later (sooner, almost definitely), that tree branch is going to snap in half and leave you weaponless. That process - acquire weapon, bludgeon bad guy, break weapon - is endlessly repeated throughout the game, the cycle broken only by the Master Sword, which even still powers down for a while after overuse. And fine, weapons can break - that’s certainly been done in games before. But when your reward for solving a particularly devious puzzle is a brutal but eminently breakable new sword, the thrill of that reward comes with a few asterisks. Sure, weapons become far more durable than that first porcelain tree branch as the game progresses, and I wound up finishing the game with more swords stockpiled in my inventory than any reasonable adventurer should need, but I can’t shake the feeling that I would have better appreciated, say, my Thunder Sword if there had been only one Thunder Sword, and I’d discovered it through methodical questing and been able to use it with reckless abandon and without fear of it shattering in my hands. The vanquishing of enemies, likewise, is an impermanent act in BOTW. To be fair, that’s true of all Zelda games, but it feels more conspicuous here, what with the regular blood moon ceremony announcing the perfunctory resurrection of every baddy Link has recently felled. I don’t know that I’d argue that perma-death for the bad guys is a good alternative, as it’d be absolutely weird to walk around a Hyrule populated only by wild horses and crickets, but there’s a feeling of futility in seeing an enemy outpost that you’ve worked hard to overthrow suddenly restocked like a vending machine. Finally, there’s BOTW’s “story,” which is really more like a set of broad prompts and, if you pursue the memories quest, a collection of brief cut-scenes that elucidate Link and Zelda’s relationship by showing some quieter moments in happier times. Criticizing BOTW’s story is a tricky task, as I’m fully aware that the game is intentionally not story-driven and that its most devoted fans likely see that as a feature, not a problem. For me, though, leaving BOTW so devoid of plot seems like a missed opportunity. And on an unrelated note, but since you asked, it just so happens that, why yes, I did recently play The Witcher 3, which features a humongous open world of its own but, unlike BOTW, stuffs it to the brim with characters and lovely, complex story. There are plenty of ways to skin a cat (don’t skin cats), and there’s no requirement that an open-world game be plot-driven to any degree, but after I became accustomed to the initial shine of Hyrule’s gloss, the first game I was reminded of was Playstation 1’s “Tale of the Sun,” and not in a positive way. As a young man of eleven or so, I remember sprinting around that game’s enormous world, wondering what in the holy hell I was supposed to do with it, and then watching sadly as my caveman eventually laid down on a mesa and starved to death. There’s far more guidance in BOTW, of course, and plenty more to do, but “huge map, sparsely populated” isn’t an inapplicable description of the game. 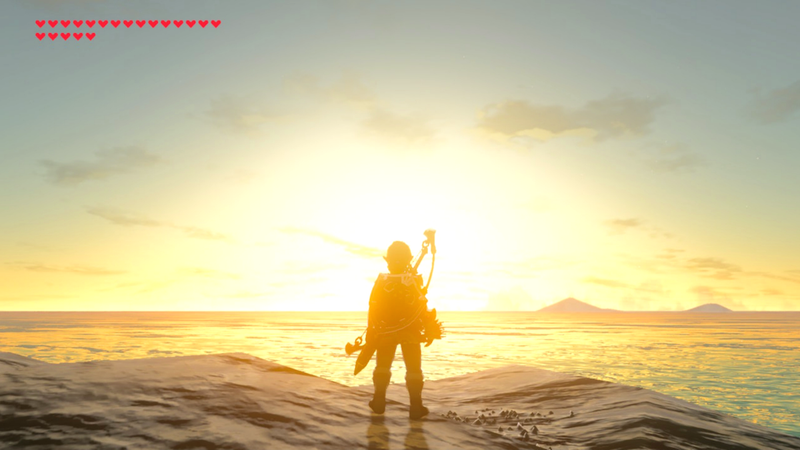 The idea of permanence as applied to BOTW’s story comes into play in the sense that, without any real plot outside of the broadest of broad strokes to drive the action, there’s no strong sense of motivation to progress other than the sheer joy of exploration, and no real feeling of having left any tangible impact on the world at large. Granted, Link can discover and solve hundreds of puzzles both small and large, but nearly every single puzzle and its reward is designed to impact only Link through stat boosts or items. Only rarely do they impose more than nominal change on anyone or anything else. The joy of exploration in this game is powerful, don’t get me wrong - hell, I happily played through to the end of the game and then some - but it could have been so gloriously enhanced if paired with a compelling narrative, whether story-driven or implied by a progression arc. Narrative could have been the stinky cheese to the exploration’s (delicious, subtle, complex) wine, in other words. What are we left with, then? A game with a compulsively explorable map but no real story, an armory of weapons to collect, all of which will one day break, and an immortal battalion of goblins and lizardmen. That’s not nothing, and there’s genuine delight to be found in simply discovering what’s over the next ridge (a much more pleasing point of 90’s comparison for me was The Genie’s Curse, an Arabian-themed PC action-adventure game, which I was reminded of while happily lost in a sandstorm deep in the southwest corner of the map), but even so, I finished the game feeling more empty than full. Here’s a strained analogy: when I finish a book, it’s every bit as abruptly “over” as the end of BOTW, but I feel satisfied because I’ve experienced its narrative; with BOTW, there were only ever my self-made adventures to serve as story, and while I stumbled into some memorable moments, my takeaway was more of a vibe or a mood than anything specific. Pushing the analogy to its breaking point (sorry): I wouldn’t have read a book about my adventure. I’d have put that book down right around the fourth time Link slew a bunch of bokoblins underneath their skull fort or turned tail and sprinted away from an unexpected Lynel. For me, the best part of BOTW was a quest roped off from the rest of the world, one that, because its sandbox was so much more limited and because the game was for that brief moment comfortable with saying “no,” generated its own self-contained narrative. Link washes up on the shore of a small island like Robinson Crusoe and is summarily relieved of his entire inventory, instructed to solve a series of puzzles through sheer resourcefulness and wit, and forced to reckon with opponents who would present a tough fight even were he fully equipped. That Hinox didn’t go down easy, and that’s a quest I’ll remember. In almost every case, BOTW succeeds at what it it sets out to do - I only wish it had set out to do a bit more. Because, you see, I’m greedy. In cases like this, I’m reminded it’s the journey, not the destination, and I’m certain there’s truth to that, but I do get a little misty when I think about how this incredible journey could have been even better.